No time to wait hours for pork to cook? 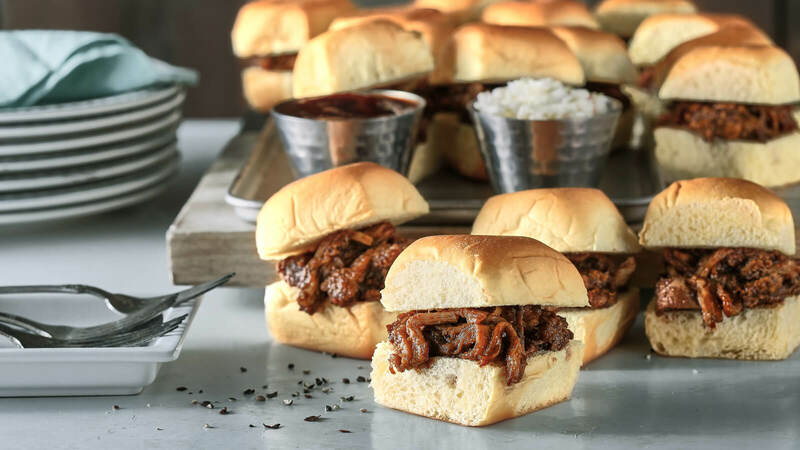 Try our wonderful slider tray made with Pulled Pork and Honey BBQ Sauce served on Hawaiian Rolls. Top them off with our Coleslaw served on the side. Reheating Instructions: Remove the top layer from the sliders, and place the pork topped bottom layer onto a foil lined sheet tray and bake in a 350°F preheated oven for 25 minutes. Return the top layer to the sliders and bake an additional 5 minutes. Remove from oven and serve immediately by cutting them into individual sliders, or leave whole for a pull-a-part option.